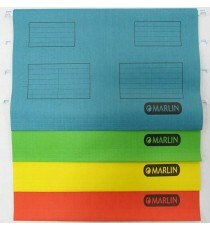 Product Lead time: 4 to 7 working days Marlin Suspension Folders 25's Foolscap Blue .. Product Lead time: 4 to 7 working days Marlin Suspension Folders 25's Foolscap Green .. Product Lead time: 4 to 7 working days Marlin Suspension Folders 25's Foolscap Red .. Product Lead time: 4 to 7 working days Marlin Suspension Folders 25's Foolscap Yellow ..